South East Australia has been suffering through a cold few days, brought on by a vortex of cold wind and rain from Antarctica. But when it comes to cold weather, us Aussies are pretty wussy! Most of us need to, how does the saying go... 'drink some cement and harden the f**k up'. Cause our cold days are nothing like what you northern hemisphere folks deal with every winter. Ok, so it snowed in a bunch a places that never see snow, so of course all the news channels have been all over it, but seriously, it only got down to a daytime max of 6 degrees celsius here, so it wasn't that cold. 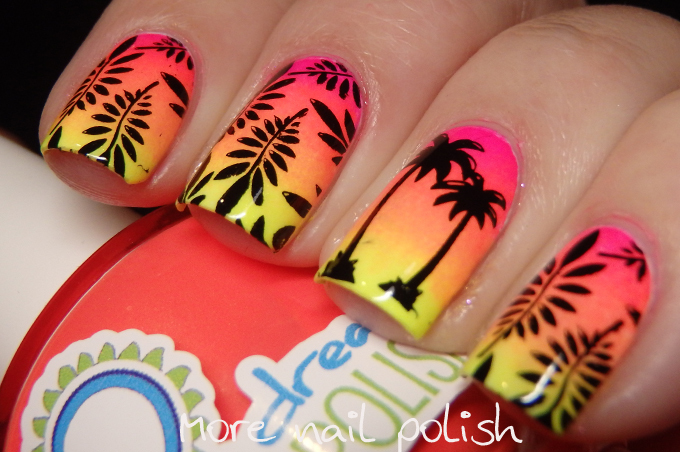 But what better way to laugh off the cold weather than with a neon sunset and palm tree inspired look. I used three polishes from the Pipedream A Night in Vegas Collection for this, sponged on over a white base. 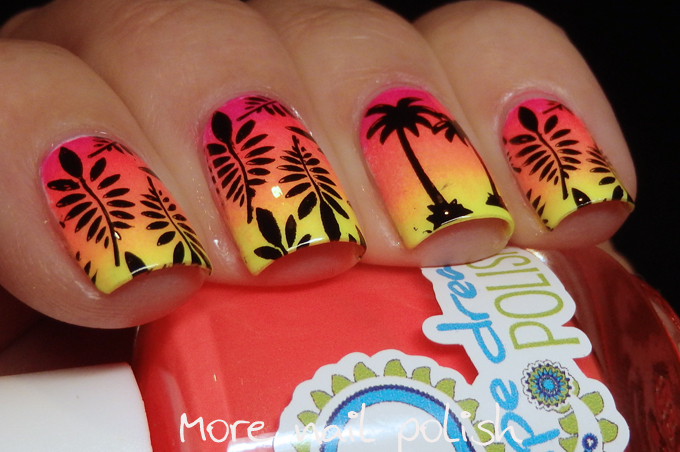 Stamping is from Born Pretty plate BP-L001 for the palm leaves and Moyou plate Back to the 80's 04. 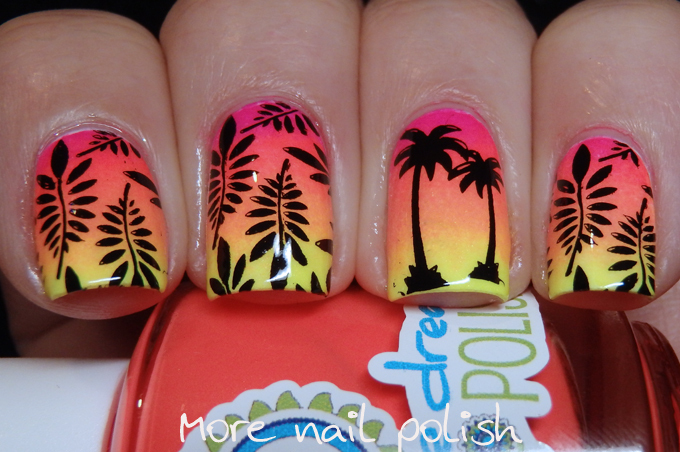 Yay for warm summery manis in the dead of winter! incredible work, i like it so much ! hope the weather will be better , soon! That Is Beautiful Work ! Gorgeous! Makes me want to visit Hawaii!! These are beautiful! And the stamping is so crisp. Love it! Haha ! But when it comes to hot weather, us Frenchies are pretty wussy ! We've just had 15 days of heat wave in France (more than 40 ° C). Most of us need to "boire la mer et ses poissons" drink the sea and its fishes. It was SO hot, we aren't used. It's so weird that the seasons are different in different places. But heck 42 degrees is still freezing to me. I grew up in NY, but now live in LA. 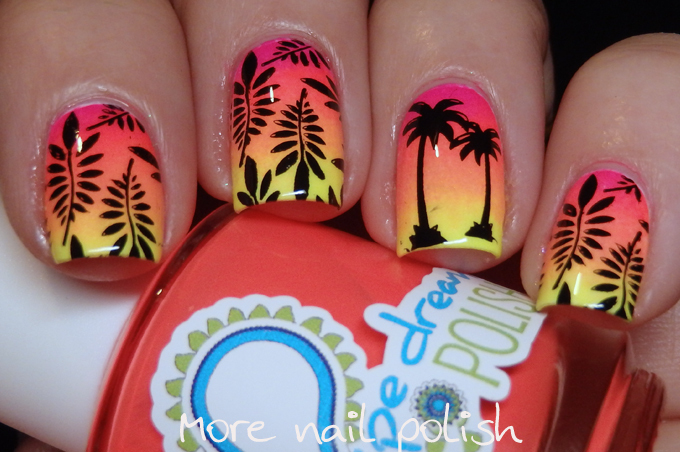 Who doesn't love a neon tropical mani in the middle of winter?!!! Love your mani and design. And I'm gonna have to remember that saying! I can relate on not being used to cold weather. Where I live is sub-tropical (Houston, Texas) and, most winters, we don't get freezing weather, much less snow. (However, the last two years have been ... different!) If it looks like we are going to get that kind of weather, the news channels go nuts with reporting about the upcoming weather and everyone panics! The grocery stores are mobbed, and the milk and bread aisles are stripped within 4 hours. The next to go are the canned goods. It is crazy. Almost as bad as when a tropical system (tropical depression to a hurricane) targets us! It's so hot and dry right now that cold and rainy sounds wonderful. I'm ready for Fall and cool air! Ouch - a max of 6 degrees in the daytime? Sounds cold enough to me! (um, yeah... I'm from Perth, so I clearly have NO idea...) :o) Love the colour gradient you did here!